Perennial herb from an enlarged stem-base or short rhizome, fibrous-rooted; stems solitary or clustered, erect to spreading or reclining, 10-50 cm long, short-hairy to glabrous, 4-angled. All stem leaves or some basal; opposite, lanceolate or elliptic to broadly egg-shaped, 2-7 cm long, 0.7-4 cm wide, entire or obscurely toothed, glabrous or lightly hairy; stalks 5-30 mm long; lower leaves often broader with more rounded base than upper. Inflorescence of many flowers in dense terminal spikes, 2-5 cm long, about 1.5-2 cm wide, usually subtended by upper leaves; bracts kidney- to egg-shaped, about 1 cm long, reddish, tips pointed, margins hairy; corollas tubular, blue-violet or occasionally pink or white, 10-15 mm long in bisexual flowers, 8-11 mm long in pistillate flowers, fine-hairy inside, 2-lipped, the upper lip hood-like and entire, the lower lip 3-lobed with broad middle lobe; calyces dark green to purplish, 7-10 mm long, 2-lipped, lips longer than tube, the upper lip squared-off and with 3 short awns, the lower lip with 2 lanceolate spine-tipped teeth. Nutlets, 4 clustered together, egg-shaped, smooth. 1. Principal stem leaves lanceolate to egg-shaped (averaging one-third as broad as long), narrowly wedge- shaped to abruptly pointed at base.................. ssp. lanceolata (Bart.) Hult. Mesic to dry roadsides, waste places, lawns, fields and open forests in the lowland, steppe and montane zones; common throughout BC, S of 57degreeN; ssp. lanceolata - N to AK, E to NF and S to NC, KA, NM and CA, ssp. vulgaris - introduced from Eurasia. 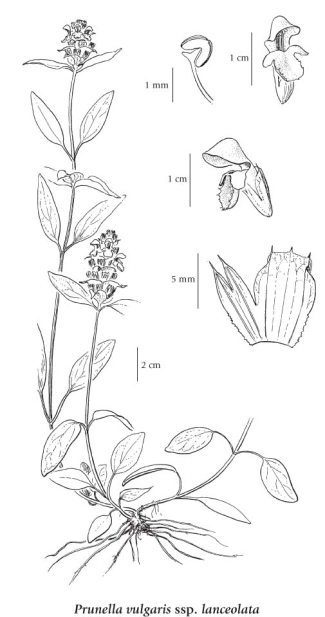 Prunella vulgaris var. elongata Benth.